Subscribe to Quilters Companion magazine for 6 months & save 23% off! There is nothing quite like a homemade quilt and nothing more satisfying than creating it yourself. From planning and creating the design to selecting the colour palette, choosing the fabrics and sewing it together – it really is a work of art. If you, or someone you know is passionate about quilting, you’ll love Quilters Companion. Every issue contains ten, exquisite patchwork and quilting projects, each with their own pattern and comprehensive instructions plus a free DVD for some virtual, practical assistance. Be inspired by the latest techniques and news from the quilting world and visit the studios of Australia’s talented quilters and artists. Regulars include ‘How Did They Do It’ – a fascinating section that deconstructs a finished quilt; and ‘Learn How To’ – introducing new techniques and use of fabrics and colour. Plus look out for ‘Cool Tools’ to keep you up-to-date with the must-have tools of the trade. QUILTERS COMPANION MAGAZINE is Australia’s most inspiring and unique patchwork and quilting magazine. Each issue contains exquisite patchwork and quilting projects with accompanying patterns! Featuring both hand and machine projects, it will entertain novice and experienced quilters alike.Quilters Companion offers the highest in quality reading as well as representing the diverse interests and skills of its readers by featuring all styles of quilts from traditional through to contemporary. Bi-monthly plus 2 Special Editions. Classy magazine. Super thick magazines with lots of exciting projects. This magazine provides some amazing quilt designs to make...the only bad thing is that I don&apos;t have time to make every quilt! I am a patchworker living in Great Britain and I have discovered your magazine at the Malvern Patchwork show in May. I am currently receiving the americ;an magazine "Quilters Newsletter" but i have been increasingly disappointed with it and now it is time to renew my subscription. I have been looking for a magazine which is inspiring, which combines the traditionnal and the whimsical. I am French and have also been looking at French mags, but I have not found something there which appealed to me. 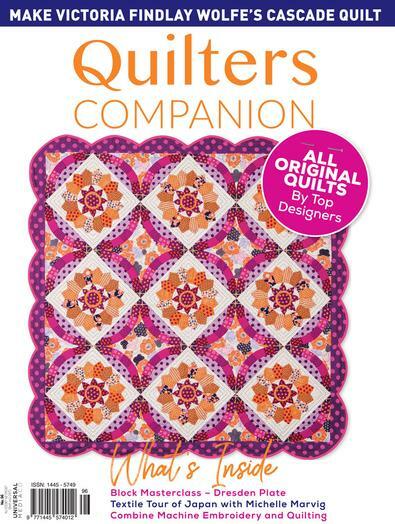 I bought the Quilters Companion January 2002 at Malvern and keep reading it and reading it., I like the Margaret Cormack article as I am also interested in Celtic "with a slant", the hexagon table cover which adds a new dimension to english hexagons. I have recently bought a Bernina with embroidery software, and the article on redwork and paisley charm have fired my inspiration on how to use my embroidery software. The little quirky angels an the patterns are also different and excellent.. from a new reader..